Description: Anthro quetzal. Her body is covered in blue-green feathers except for her stomach and chest, which is red as well as the underside tail feathers which are white. Her tail is extremely long. Her feet are digitigrade and covered with grey scales much like a real bird's feet. Personality traits: She's a warrior woman but carries herself with digity. She is distrustful of people she dosen't know. She's a relatively new character so I don't have a lot of reference pictures of her. But I do have a completed character sheet. 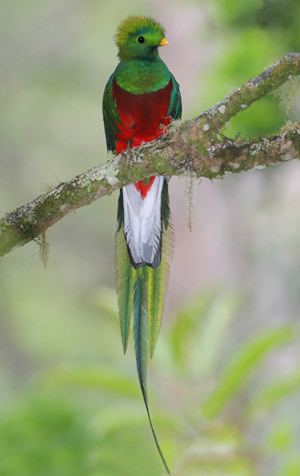 And for the heck of it... some pictures of real quetzals since they're a relatively obscure species.